More than just technology, integration of connectivity into a device requires a combination of expertise, insight and skill. Based on our experience operating complex projects around the globe, we have developed a well-tested process for building IoT solutions. Together with our partner network, we provide an end-to-end solution, from concept and design to monetization and operation over time. To find the solution that works best for you, our experts provide insight and guidance from day one, beginning with the basic question – why should your business be connected? 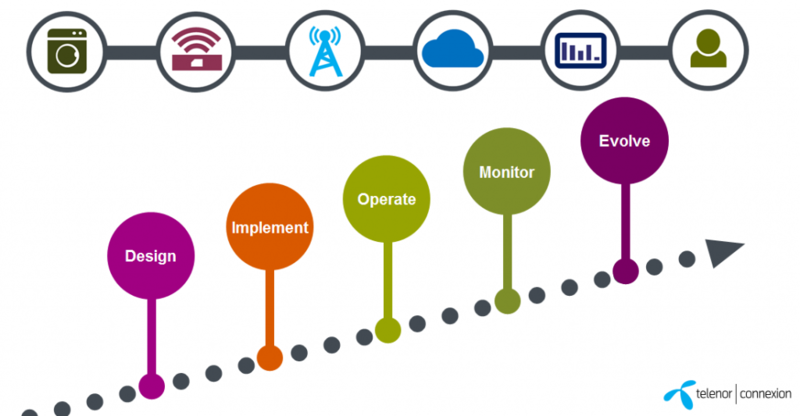 With a strong process, we can help you get started with IoT and succeed over the long term. Below is an outline of the strategic approach we take to every project. We work closely with you to create a clear strategy, where the main motivations and benefits are defined and agreed on. Defining your business’ key requirements (including target groups and geographical scope) along with the desired outcomes (cost reduction, new revenue streams or increased customer loyalty) facilitates an efficient building and implementation process. Once the project plan is agreed upon, implementation begins. Turning something complex into something easy is our mission. When we design a communication solution, we always consider security, performance and compliance. We take you through every step of integrating communication hardware and software into your product, prioritizing usability and reliability. Finally, our Project Managers take you through the Testlab to fine tune your solution before deployment. We can handle the continued operation of your IoT solution, or help you with the best practices to operate it yourself. Our open API integrates with your existing business systems, giving you full command of your connected devices. The web is portal standardized for any sort of device: computer, tablet or smart phone, giving you access anywhere you may be. To ensure your IoT device is always online, our security package offers end-to-end encryption, as well as fail-over mechanisms, alarm triggers and redundancy. Our web-based service portal gives you complete control of your connected devices. The service portal offers a wide range of tools, including: SIM-Management, Real-time Traffic Surveillance and Alert Functions, Statistics and Diagnostics, as well as Billing and Support. Supporting you day and night, our daily operations team is the heart of our business. 24/7 monitoring means that we constantly optimize your system, and proactively solve issues before they arise. Based on Big Data analytics, our ARTS platform provides real-time insights into the performance of IoT devices and networks to give you a deep understanding of how your devices and machinery function in the IoT ecosystem. Using this data effectively will help to continually improve your current solution, and serve as a guide to finding new IoT solutions and use cases as your business grows. There is a lot to consider when beginning an IoT project. Here are the crucial steps that must be taken at the beginning of every successful IoT project. Choose communication software that fits various mobile networks. Assure the solution is compliant to standards and regulations in different countries. Make the solution secure from terminal to application. Determine the best solution for data storage and management. Decide how should the data be used within the organisation. Map out how the solution will be operated and supported over time. Create a plan for fulfilment, warehousing, testing unit with SIM, packing, returns and shipping. Build for minimal cost of ownership over time.